Good news for the Oakland Raiders: They will not lose this week (yes, they have a bye). 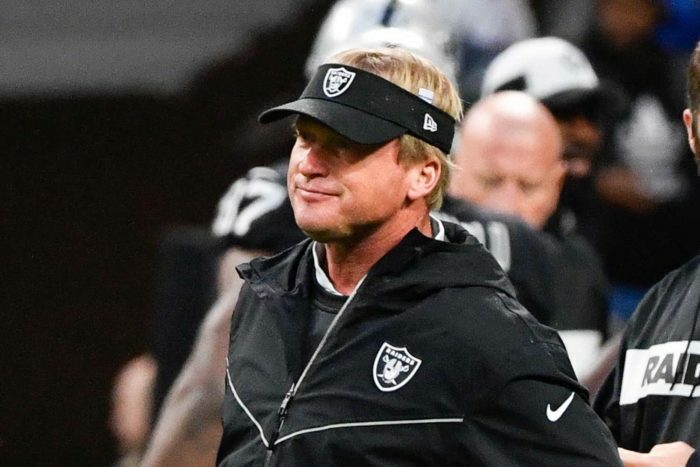 Bad news for the Oakland Raiders: The losses will continue to pile up after the bye if new/old head coach Jon Gruden persists in his current approach. There are several reasons for this. At the break, the Raiders are 1-5. They’ve lost two games in a row by double digits. Earlier in the season, they blew back-to-back games in which they had fourth-quarter leads. Overall, they’ve been outscored 176-110 – the worst point differential in the league. The season did start off promising. Well, at least for one half. The Raiders played a good first half against the Los Angeles Rams in the Monday night season opener. That game, however, ended in a loss. It didn’t get much better after that. After an 0-3 start, they finally got their first win of the season in Week 4 when they beat the Cleveland Browns and Hue Jackson, a former Raiders head coach. In the two weeks since then, they haven’t been competitive. In last week’s 27-3 loss to the Seahawks in London, they never had a chance. They lost as soon as the game appeared on the schedule. Why? Well, the Raiders arrived in London on Friday for a Sunday game basically because Gruden gets air sick. Does this sound like the mindset of someone who is ready to lead an NFL team? Oakland Raiders fans expected better. After all, Gruden is a Super Bowl-winning head coach and the Raiders are just one season removed from a playoff appearance. Gruden led this same organization to the AFC Championship Game. The fans just expected more. Part of it was nostalgia and the belief that Gruden would fix the team the way he helped fix the team in the late 1990s. They thought Gruden would be able to work wonders with quarterback Derek Carr, wide receiver Amari Cooper and running back Marshawn Lynch. Instead, it appears the Raiders under Gruden are further away from contending for respectability than they were a season ago. Pundits expressed concerns that Gruden was gone from the sidelines so long that he was not going to be able to adapt to the modern game. After six weeks, we are thinking the pundits might be right on this one. It isn’t just the travel to away games. It’s how he deals with the roster. He is, after all, the unofficial general manager of the team. Gruden has managed to trade away his most impactful player in rush end Khalil Mack. He brought in older players, such as former Chiefs linebacker Derrick Johnson, that were expected to make a meaningful contribution but have since been cut. He doesn’t like the younger players he inherited. He’s refused to play some of the previous regime’s high draft picks or has just outright cut them. In the process of doing all this, he’s compiled what is the league’s oldest roster. But it doesn’t seem like Gruden is finished revamping the Raiders roster. Various reports state that the Raiders are willing to part with players for picks. Apparently Amari Cooper can be had for a first-round pick. After the bye, the Raiders have winnable games versus the Colts in Oakland and across the Bay against the 49ers. After a home game against the Chargers in week 10, they head to Arizona to play the Cardinals. This isn’t the most challenging schedule. But will they be able to right this ship? We don’t think they will. Odds are not in Gruden’s favor. He and the Raiders also must deal with the organizational distraction of being in Oakland but looking ahead to their upcoming move to Las Vegas. If they make moves to acquire draft picks — giving up some marketable veteran players in the process – this won’t sit well in a locker room that has already seen Gruden trade away the team’s best player in Mack. Will the team be any better in 2019? Will they even be in Oakland? The stadium lease expires after this season. They aren’t slated to begin play in Las Vegas until 2020, though they could end up playing home games in 2019 at Sam Boyd Stadium in Paradise, Nev.
Generally one stumbles out of Las Vegas. This has the feel of a team that is stumbling in.